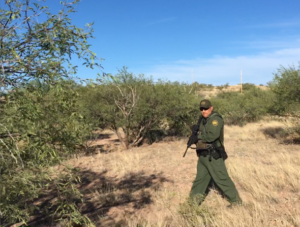 Thursday, June 15, 6:00 p.m., Arivaca, AZ—In temperatures surging over 100 degrees Fahrenheit, the US Border Patrol raided the medical-aid camp of humanitarian organization No More Deaths and detained four individuals receiving medical care. 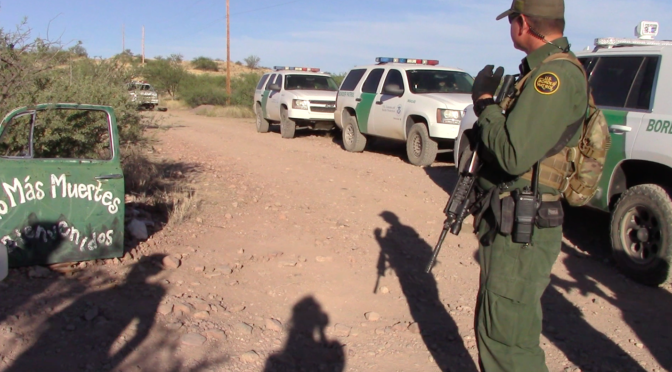 Obstruction of humanitarian aid is an egregious abuse by the law-enforcement agency, a clear violation of international humanitarian law, and a violation of the organization’s agreement with the Tucson Sector Border Patrol. A helicopter, 15 trucks, and 30 armed agents descended on the medical-aid station to apprehend four people receiving medical care in deadly summer heat. Agents from the Border Patrol began surveilling the No More Deaths camp on Tuesday, June 13 at around 4:30 p.m. Agents in vehicles, on foot, and on ATVs surrounded the aid facility and set up a temporary checkpoint at the property line to search those leaving and interrogate them about their citizenship status. The heavy presence of law enforcement has deterred people from accessing critical humanitarian assistance in this period of hot and deadly weather. These events also follow a pattern of increasing surveillance of humanitarian aid over the past few months under the Trump administration. This afternoon, in an unprecedented show of force, approximately 30 armed agents raided the camp with at least 15 trucks, two quads, and a helicopter to apprehend four patients receiving medical care. For the past 13 years, No More Deaths has provided food, water, and medical care for people crossing the Sonoran Desert on foot. The ongoing humanitarian crisis caused by border-enforcement policy has claimed the lives of over seven thousand people since 1998. Human remains are found on average once every three days in the desert of southern Arizona. People crossing the deadly and remote regions of the US–Mexico border often avoid seeking urgent medical care for fear of deportation and incarceration. For this reason, a humanitarian-focused aid station in the desert is an essential tool for preserving life. The targeting of this critical medical aid is a shameful reflection of the current administration’s disregard for the lives of migrants and refugees, making an already dangerous journey even more deadly. In spite of this, No More Deaths remains committed to our mission to end death and suffering in the desert and will continue to provide humanitarian aid, as we have for the past 13 years.